Homeowners throughout Phoenix utilize their water heaters every day without much thought. Warm, running water is available for things like baths, showers, cooking, and doing the laundry. It’s said that the average person uses warm water in their home up to 20 times a day. Now, think about how much that would be if you multiply it by the number of people in your household. Quite a bit, huh? 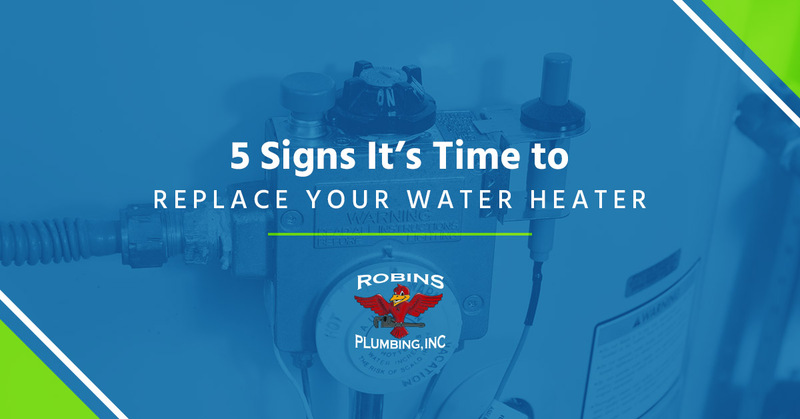 At Robins Plumbing, Inc., we understand how important your water heater is to your home and family, which is why we provide prompt and professional water heater services throughout Phoenix. As your water heater works to provide you with warm and hot water throughout the day, there will be times where it fails you, and that’s totally normal. Most water heaters have a lifespan of about 10 years, and if you keep up with regular maintenance, your water heater could last up to 15 or 20 years. As a homeowner, it’s important that you’re aware of the signs that it may be time to replace your water heater system. Let’s take a look at the top five signs below! Just like any appliance, your water heater will deteriorate with age. As we mentioned above, most water heaters can last up to 10 years, which is around the age where replacement is highly recommended. Even if your water heater isn’t showing signs of failing, once a decade has passed, you should take a look at the system’s manufacture date. This will give you a good indication as to whether it’s time to replace your current water heater. To learn about the age of your home’s water heater, look for the serial number. This number is usually printed on a manufacturer’s sticker that can be found on the upper half of your water tank. It’s important to note that the numbers you see listed won’t be in an easily identifiable format. Instead, they will be numbers that looks something like this: G087844596. The beginning letter will either be a G, D, or an I, and they stand for the seventh, fourth, and ninth months of the year. The first two numbers after that will represent that last two digits of the year that the water heater was manufactured. If you hear a loud banging noise coming from your hot water heater, this is an indication that something is not right. This issue is normally found in older water heaters as sediment builds up in the bottom of the tank. Over the course of time, this seemingly harmful sediment will start to harden on your tank’s floor and can result in strange noises. This is not great news, as it means that your water heater is not running as efficiently as it should be. If you leave this problem unattended, you may accelerate the damage to your hot water heater, resulting in a costly replacement sooner, rather than later. It’s very common to find standing water around the tank of your water heater, especially as your system reaches the end of its lifespan. Most water leaks are due to an expansion of your metal water tank. As the years go by, your water heater is exposed to hundreds of thousands of heating cycles. This will ultimately alter the shape of your water tank, which is when a fracture can occur, resulting in a leak. This can lead to carpet damage and saturated valuables like electronics and furniture, so if you notice standing water near your water heater, contact a professional plumbing company right away. They’ll schedule a convenient time to visit your home and inspect your water heater before recommending the best water heater replacement or repair options for you. Are you having trouble accessing hot water in your home? Does it take your kitchen faucet a few minutes to warm up before providing you with the hot water you need? The loss of heat in your water heater can come down to a few different issues. Let’s take a look at each of them below. If you can’t seem to get the hot water you need for your morning shower, there may be something wrong with your thermostat. Your water heater thermostat settings should be set somewhere between 120 and 140 degrees Fahrenheit. If this is not the case, adjust your thermostat to see if the new temperature makes a difference. Depending on the size of your home and how many people reside with you, the size of your tank may be what’s preventing you from accessing sweet, warm water. For example, if you have a 25-gallon water heater for a six-person household, there’s a good chance your heating system can’t keep up with your warm water demands. Another surefire sign there is something wrong with your water heater is if your water comes out rusty, brown or contaminated. Most water heater systems are made out of steel, and one of the downsides of this material is that is susceptible to rusting. When your water heater’s components start to rust, a leak will soon follow. Don’t wait until it’s too late to call your local plumbing company, otherwise, you may end up having to replace your system completely. If you live in the Phoenix area and you’re concerned that your water heater may be biting the dust, reach out to the professional plumbers at Robins Plumbing, Inc. We specialize in the repair and replacement of all different types of water heaters, including tankless gas water heaters, tankless electric water heaters, and hybrid water heaters. We also offer drain cleaning, blockflow prevention, and residential and commercial jetting services. Contact our team today to schedule an appointment with our plumbing company today! We look forward to hearing from you.